One job. Two candidates. Which one will be the most successful? In the Blue corner we have the external candidate. He’s new to the company but with industry experience, a great education and fresh ideas. He’s looking to smash his new role. In the Red corner, we have the internal candidate. This job would be a promotion for him but he comes prepared with insider information and a ready built network so his confidence is high. But which one will be the most successful? The person hired or the person promoted into the role? Who would you put your money on? Let’s see if you are right. Professor Matthew Bidwell from the Wharton School conducted a study on this subject. He conducted his research within a division of a large investment bank, analysing 7 years of data covering 5,300 employees in a whole variety of roles. His findings were as follows. 270 % more likely to get the lowest rating. They took 3 years to achieve similar performance to those promoted into the job. The result may not surprise you, but the big numbers may have done. The strength of that inside knowledge and the proven cultural fit shouldn’t be overlooked. His study then reveals the final knock-out punch. The new hires – who performed worse than the internal candidates – were paid on average 18% more. And it took up to 7 years for that pay gap to close. Time to focus on the talent in your business? So before you start re-energising your staff development programme, here are three things to think about when you are promoting from within. In the excellent People Analytics course on Coursera, Professor Bidwell refers to a study conducted by JR Keller. A manager identifies someone he wants to promote through his personal network and makes it happen. So here’s your second question of the day: Which of those two options do you think is more successful? The candidate that has to apply in a competitive process or someone that is identified and promoted? Well, Keller showed that it’s when a post is advertised internally. Successful candidates promoted in this way had higher performance ratings. One reason is that it provides you with a larger pool of candidates to choose from. It also creates unconventional career paths, attracting great candidates you may not have previously considered. It brings a discipline to decision making as people have to justify their decision with this more formal approach. Therefore, the hiring manager is more structured in reviewing the strengths and weaknesses of each candidate. Keller also made an interesting discovery about individuals who would have been promoted automatically by their managers. When they had to apply for the role and compete against others they were more successful in the job. This approach is important for your other employees too. It is frustrating when someone is just promoted into a position you would have liked a shot at. This can cause huge dissatisfaction within your team when the chance for progression never seems to come their way. To retain great talent, you need to be consistent and fair when opportunities arise. A 2015 LinkedIn Job Switchers report found that the number one reason people switched jobs was to find better opportunities for job advancement. Don’t underestimate how important cultural fit is within your organisation. The most skilled person may fail because they cannot excel in your environment. If you have people who have the right attitude, develop their skills and allow them to grow with you. Where is your business going? What skills will you need? Identify the gap and work now to train your staff to step up. All your managers should build succession plans. They should be developing their team members so they have a natural replacement when they get promoted. And don’t forget about onboarding. 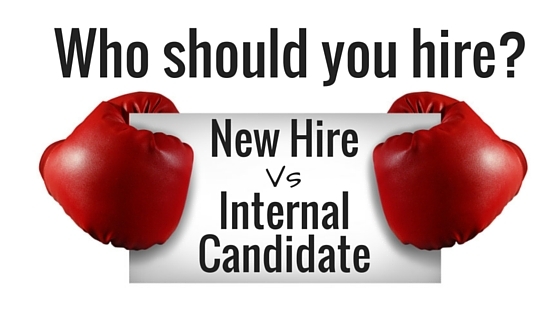 You may think that you don’t need to onboard an internal candidate, but think again. They will, of course, know where to park and how to use the coffee machine. They will understand the values of the company and will already have a good network around them. But there are new things they will have to learn. How can you help them with that? Would they benefit from a day out with the Sales Manager, a visit to a different office, some meetings with some of their stakeholders? And make sure you pull out all the stops for the toughest promotion of them all. The promotion to become a manager for the first time. Especially if he is now managing his old team mates. Give this guy all the support you can! What about when you have to hire from outside? So our internal candidate in the red corner won this match. But there will be occasions when you have to recruit from outside. When you see how external new hires did in Professor Bidwell’s study results, there is one glaring question for me. What the heck is going wrong with the employee onboarding process? A great onboarding programme is so critical to the success of your new hire. You overlook this at your peril. You owe it to your new hire to help him succeed. His success is your success. You should start the onboarding process as soon as the job offer is accepted and follow a structured path for the first weeks or months of employment. Even if you’re busy and need him operational NOW you can still make this work. There’s a ton of information about onboarding here if you’re in any doubt about what to do. Look closely at the talented individuals you have already hired and find every opportunity to develop them . Joining a new company is tough. Focus more on how to make your new hires successful.